The restaurant is on an upper level of Weller Court and on one corner is this elevated pathway to the Kyoto Grand Hotel. 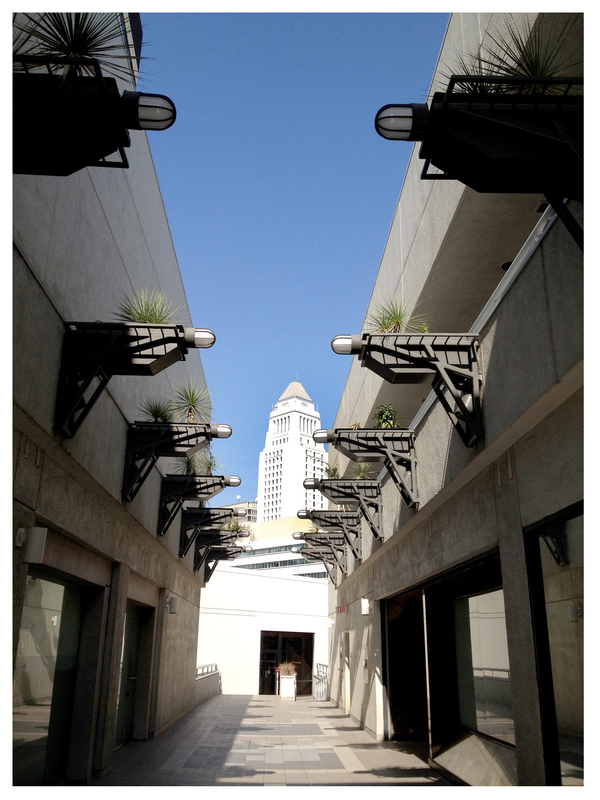 I love this corridor not only because it frames LA’s City Hall so nicely but because of the industrial light fixture/planters overhead. Right now, filled with small, spiky yuccas, they add to what I’ve always felt was a Bladerunner vibe here … wouldn’t this make a great backdrop for a claustrophobic, fight-to-the-death, anti-gravity, only-in-downtown-LA, sci-fi movie climax? … I think so, but only in the dark or while raining. Hard. 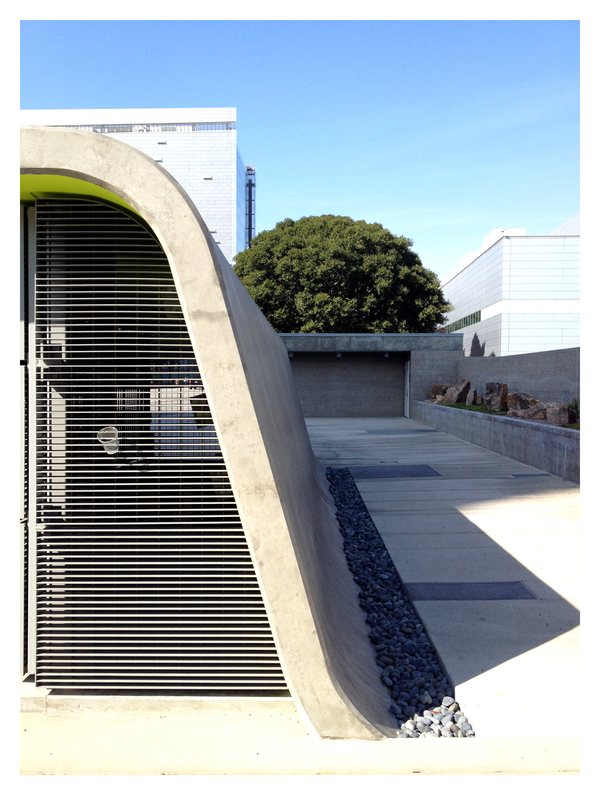 A new addition to Weller Court’s outside area on the Los Angeles St. side, is Demitasse, a schmancy coffee spot. I don’t have the patience for coffee that needs to be ‘pulled’, so I’ve never stopped in. 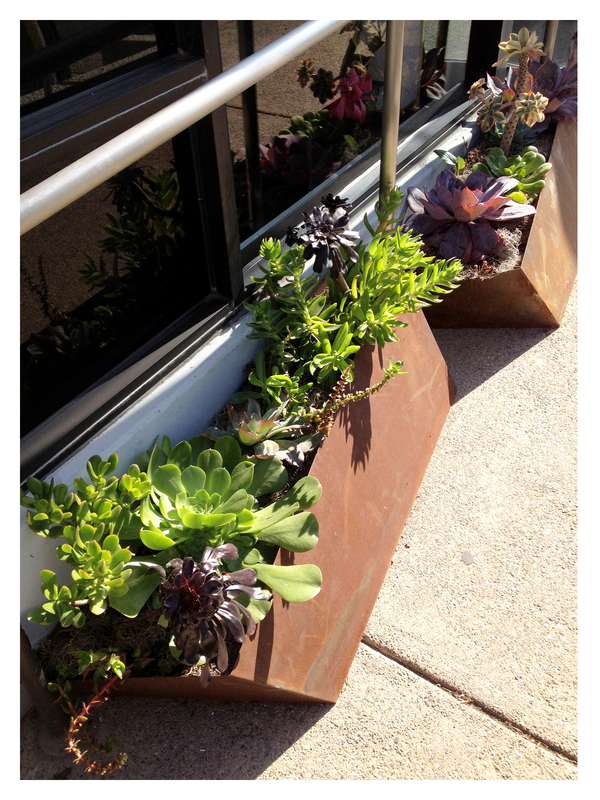 But, I have much admired the planters in their outdoor area. These canted, rusted containers line their walkway. 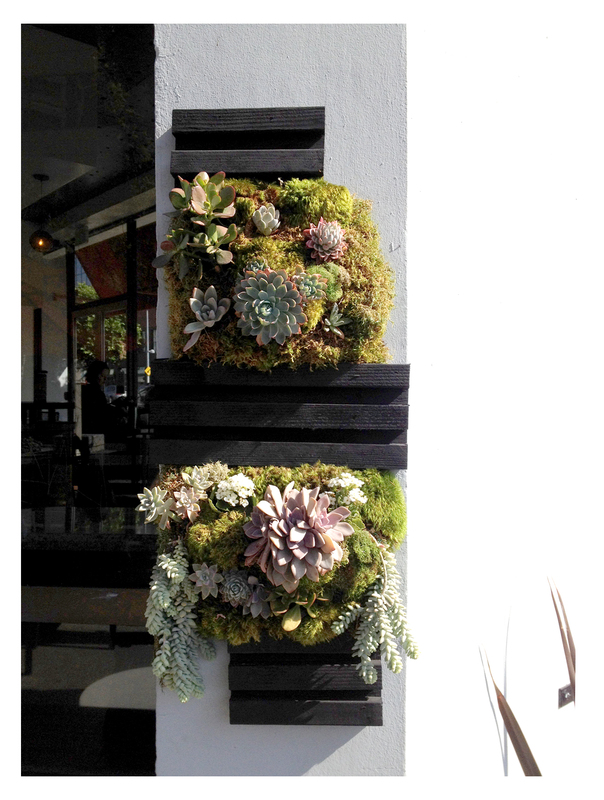 The slanted sides contrast beautifully with the succulents inside. 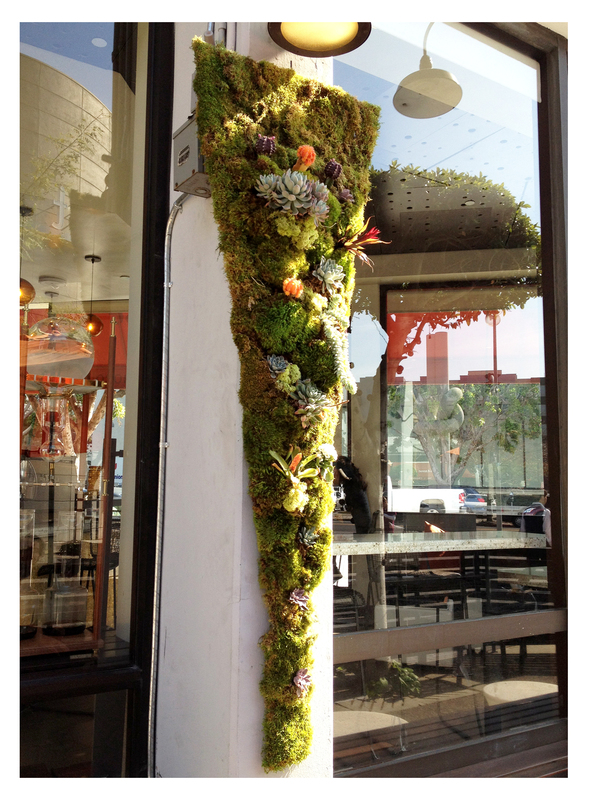 This elongated triangular wall garden is a visual delight … I have to resist running my hands up and down its mossy surface. Containing everything from silly little grafted cacti, to sedums and other succulents, it’s lushness in the sun. 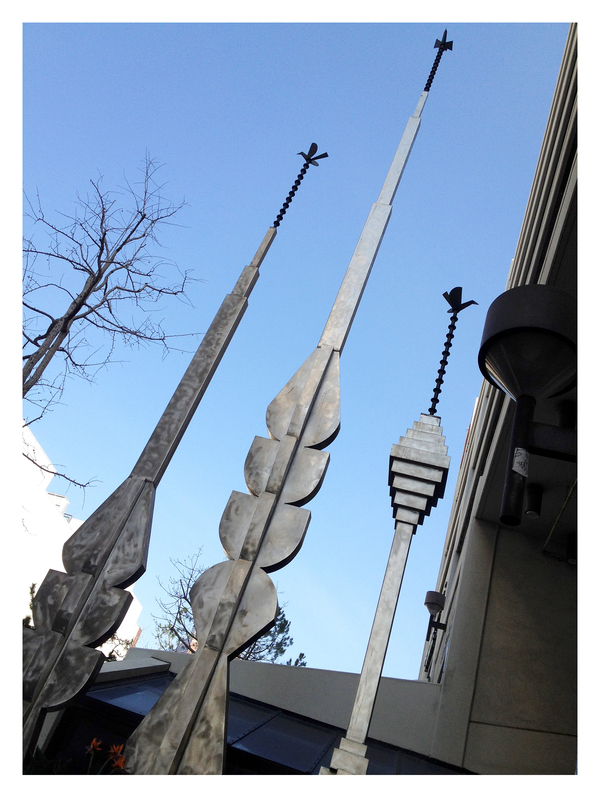 These amazing stainless steel and brass spires are the work of Japanese artist, Michihiro Kosuge, and titled ‘Towers of Peace, Prosperity and Hope’. Installed in 1989, the tallest of the three is 48-feet, and the shortest 24-feet tall. Their shapes reference traditional Japanese lanterns and architecture and each is topped with an origami-like bird in brass. I’ve loved these geometric towers forever and always wished they weren’t situated behind a bank and next to a parking lot away from the street, although I love knowing their almost-secret whereabouts. 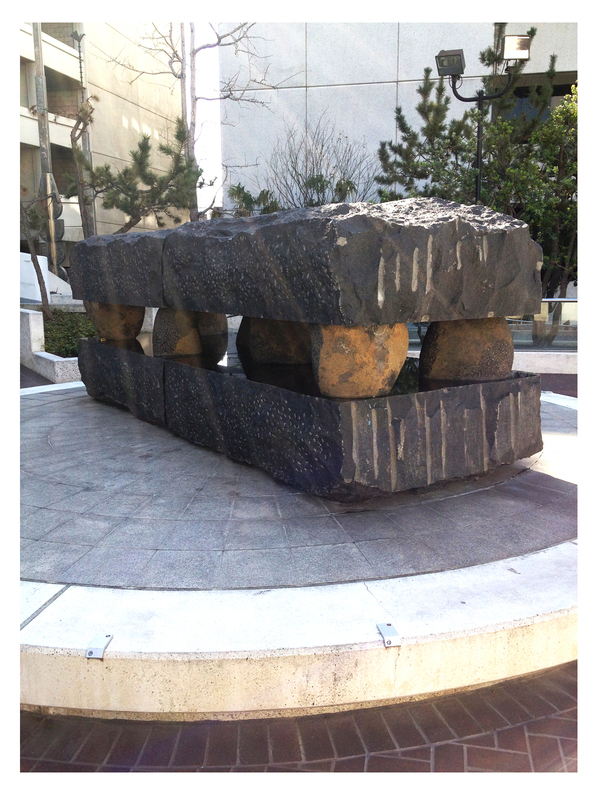 Just behind the towers is this amazing polished-and-raw granite sculpture titled ‘Stone Rise’ by Seiji Kunishima. The centerpiece of a small raised garden area, the massive stones seem less to be rising than being compressed by their stunning size and weight. Here since 1984, these remind me of sculptural stone pieces by Japanese master Isamu Noguchi; there’s a similar, almost-hidden, installation of his nearby. The newest spot on this quickie tour is Toriumi Plaza, at the corner of 1st and Judge John Aiso Streets. A striking combination of architectural features and planted areas and trees, it’s actually the top of a 300 vehicle parking structure. The plaza is named after Reverend Howard Noboru Toriumi, a community activist. 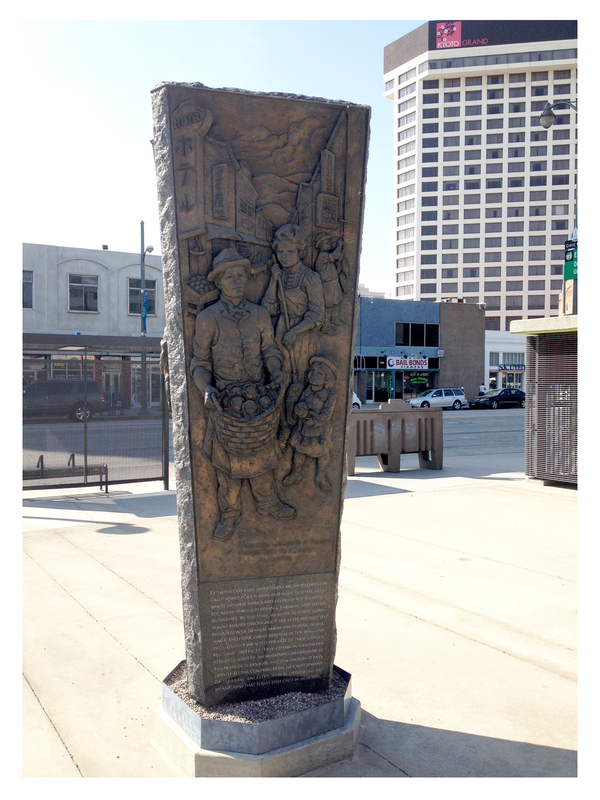 A large bronze monument commemorates the lives and struggles of early Japanese immigrants in Los Angeles and celebrates their cultural contribution to the city. I love these inchworm-like benches at the plaza … they rise from the concrete floor and seem to move … Whoa, there’s my stopwatch beeping … time’s up — the food’s ready! I trot back to the restaurant and wait for a clot of lunchers who could care less about how hungry I am to move out of the doorway. 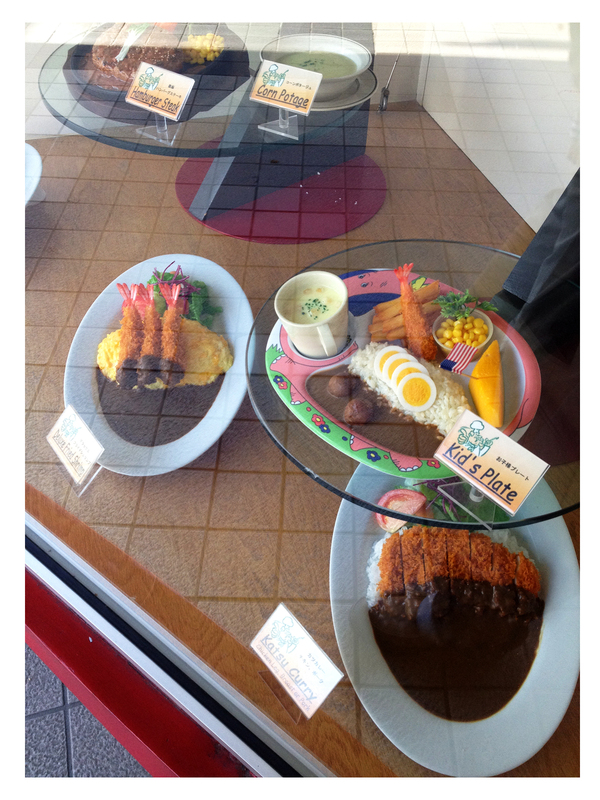 This gives me just enough time to snap the plastic faux-food in the window. Looks good, but probably a bit dusty at this point … I’m finally through the door, grab my tower of styrofoam containers (try not to judge) and head back to the office. I’m starving after all that running around! 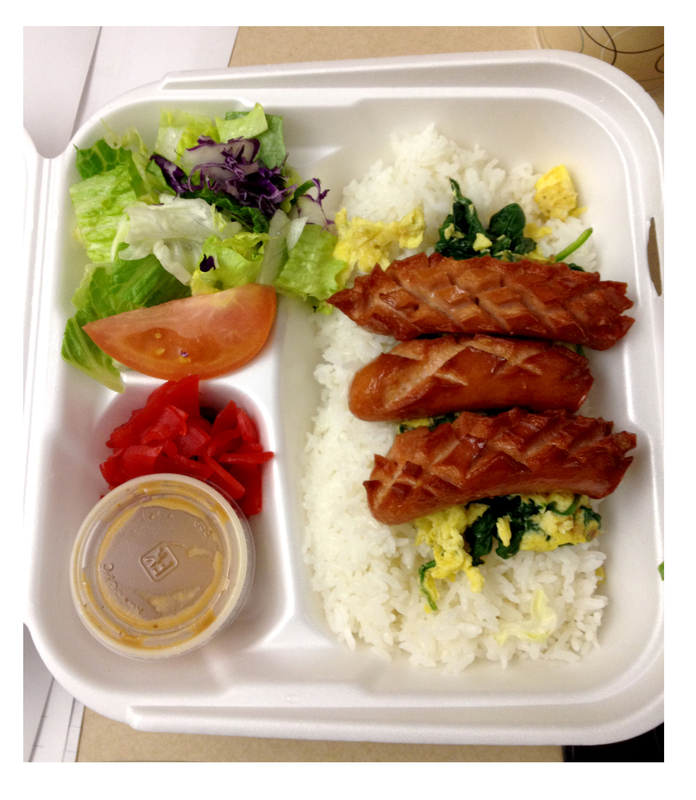 Back at the office I unveil my aromatic Japanese delicacy: Weiner and spinach with super-spicy curry sauce! I first ordered this amazing plate in the ’80s after seeing it being delivered to another diner’s table. Feeling adventurous at the time and thinking that the intricately scored wieners were an exotic bit of seafood (squid tentacles, maybe), I ordered it … When it arrived I was delighted/relieved to find out they were actually good ol’ hot dogs. Served over classic Japanese rice and accompanied by eggs scrambled with spinach, this tasty multi-culti celebration is rounded out with a small salad and pickled ginger. It’s fan-tabulous and available at Curry House in Weller Court. 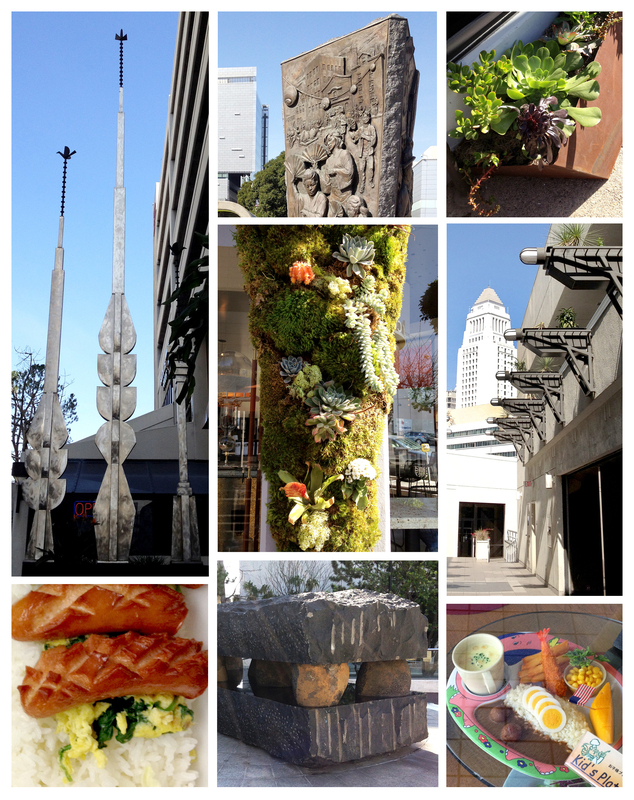 For your Little Tokyo visit, have the weiners’n’curry first, then take the quickie walking tour. 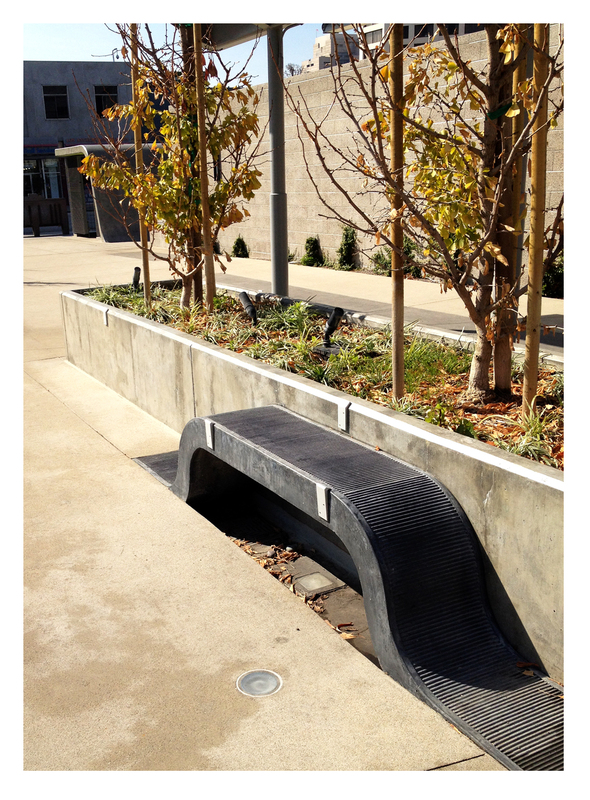 Click here for a list of public artworks. Such a yummy tour!! Sorry, couldn’t resist… So do like checking in to see what you’re up to!! Thanks…….